We’d love your help. Let us know what’s wrong with this preview of How the States Got Their Shapes by Mark Stein. We are so familiar with the map of the United States that our state borders seem as much a part of nature as mountains and rivers. Even the oddities—the entire state of Maryland(! )—have become so engrained that our map might as well be a giant jigsaw puzzle designed by Divine Providence. But that's where the Why does Oklahoma have that panhandle? Did someone make a mistake? We are so familiar with the map of the United States that our state borders seem as much a part of nature as mountains and rivers. Even the oddities—the entire state of Maryland(! )—have become so engrained that our map might as well be a giant jigsaw puzzle designed by Divine Providence. But that's where the real mystery begins. Every edge of the familiar wooden jigsaw pieces of our childhood represents a revealing moment of history and of, well, humans drawing lines in the sand. To ask other readers questions about How the States Got Their Shapes, please sign up. Great intro to understanding state history. Some of it made sense. Some of it was a little too vague, but overall, it will keep your interest and leave you wanting to dig up more on a bunch of states -- even beyond the ones you've lived in. Great for a quick read of a few pages every night. Also good to show your kids and expose them to other states at a younger age. For those new to me or my reviews... here's the scoop: I read A LOT. I write A LOT. And now I blog A LOT. First the boo Great intro to understanding state history. Some of it made sense. Some of it was a little too vague, but overall, it will keep your interest and leave you wanting to dig up more on a bunch of states -- even beyond the ones you've lived in. Great for a quick read of a few pages every night. Also good to show your kids and expose them to other states at a younger age. This book is divided into 50 short chapters, each detailing how a U.S. state acquired its shape. Easy to understand. This book at first fascinated me. I love history, and I love maps even more. I can just sit and look at a map for hours, running my mind over the lay of the land. So, I was hooked. How did West Virginia get that little finger of land that reaches toward Pittsburgh? Why aren't Vermont and New Hampshire just one regular-sized state? Why did Wyoming take a bite out of Utah, and not th This book is divided into 50 short chapters, each detailing how a U.S. state acquired its shape. Easy to understand. This book at first fascinated me. I love history, and I love maps even more. I can just sit and look at a map for hours, running my mind over the lay of the land. So, I was hooked. How did West Virginia get that little finger of land that reaches toward Pittsburgh? Why aren't Vermont and New Hampshire just one regular-sized state? Why did Wyoming take a bite out of Utah, and not the other way around? Why did Michigan get the Upper Peninsula instead of Wisconsin? What about the Oklahoma panhandle? Reading how our states were shaped is also a history lesson of its own, as it takes us back to the Revolution, the Louisiana Purchase, the Missouri Compromise, the Mexican-American War, the Kansas-Nebraska Act, and the Civil War, etc etc. It's a good way to learn a little more about American history. This book answers all the questions I had, and more. It discusses every jig and jag of a state boundary, so you get not only answers to big questions, but also descriptions of why such-and-such straight-line boundary is located at so-and-so latitude instead of another. 1. There was a whole lot of bad surveying going on. 2. Panhandles are the most telling of the political atmosphere back then. Oklahoma has a panhandle because Texas wanted to be a slave state. Florida has a panhandle because it was originally occupied by the Spaniards. Utah has a panhandle solely because of geography. 3. Connecticut actually had land all the way to the Pacific. And is the Eastern Reserve implied in the Cleveland college Case Western Reserve. 4. South Dakota and South Carolina are both weirdly shaped because of Native American reservations. 5. The Spanish and French colonies had a lot more to do with the shape of the eastern states than you'd think. This useless brick is, unfortunately, one of several self-inflicted literary infections I got by whipping out my Amazon.com iPhone App two hours deep into a happy hour. GOOD friends don't let friends do that. I need better friends, it would seem. This book is about as compelling and forgettable as those "Brain Quest" trivia cards, and poorly written. I gritted my teeth through the first several chapters that Professor Stein begins with "How come...?" Why not "why?" Or better still, why not acknow This useless brick is, unfortunately, one of several self-inflicted literary infections I got by whipping out my Amazon.com iPhone App two hours deep into a happy hour. GOOD friends don't let friends do that. I need better friends, it would seem. This book is about as compelling and forgettable as those "Brain Quest" trivia cards, and poorly written. I gritted my teeth through the first several chapters that Professor Stein begins with "How come...?" Why not "why?" Or better still, why not acknowledge that your readers bought your damn book because they are already asking that question, and then get rolling on your answer? Don't expect any good story-telling from this one, either. The drama professor performs little in the way of character development, dropping open-ended passive-voice bombs where details should sprout, such as: "...a new northern border was established." By whom? Congress? Uncle Melvin? Sure, if Stein went into as much detail for each state as Russel Shorto did for Manhattan(Island at the Center of the World (2005)), this book would be enormous. But it would also be more fun and worth your time. It is, instead, a long list of marginally interesting, casually assembled facts that would best serve the kind of people needing a rapidly detachable read in the dentist's waiting room. I guess Stein gets the last laugh, so I don't feel too bad for him. This book, or something like it, ended up feeding one of those mindless holiday History Channel trivia marathons alongside "The Presidents." Someone surely made money, mostly from people like me. Well played, sir. Well played. Many would agree with Robert Frost that "good fences make good neighbors." (or with Ben Franklin who made a similar observation 200 years prior). This book is a treasure trove of why boundaries were and are important. Stein makes some general observations about the process of establishing the states and the antecedents to our nation's control over its current territory before examining almost every mile of border from each state's perspective. It's a pleasant surprise that he makes it so interest Many would agree with Robert Frost that "good fences make good neighbors." (or with Ben Franklin who made a similar observation 200 years prior). This book is a treasure trove of why boundaries were and are important. Stein makes some general observations about the process of establishing the states and the antecedents to our nation's control over its current territory before examining almost every mile of border from each state's perspective. A nice little book with tons of interesting stories about the setting, resetting and finalizing of borders over the roughly 230 years of American History. And it delivers exactly what it says on the cover: it shows and tells how the States got their shapes. So ultimately, the only problem that i've got with Mr Stein's presentation is that i've come to read the book through the (in my eyes more than excellent) television series of the same name, where the various conflicts, clashes of interest and A nice little book with tons of interesting stories about the setting, resetting and finalizing of borders over the roughly 230 years of American History. And it delivers exactly what it says on the cover: it shows and tells how the States got their shapes. The information within the book - and for the most part the style in which it is written - is very good. The primary fault is the organization. There are two introductory sections, one laying out the point of the book and the other giving some important information that will be referenced in almost every state history. Then the book goes through each state's border history. The states are listed alphabetically which is handy if you only want to look up a few. If you only want to look up, for exa The information within the book - and for the most part the style in which it is written - is very good. The primary fault is the organization. There are two introductory sections, one laying out the point of the book and the other giving some important information that will be referenced in almost every state history. Then the book goes through each state's border history. The states are listed alphabetically which is handy if you only want to look up a few. If you only want to look up, for example, Pennsylvania and Virginia this is great. You can get your information and follow this parenthetical 'for more information see New Jersey/West Virginia' etc. It would have made more sense to organize regionally first, and then chronologically within the regions. This would have saved the author paragraphs and given him more space to expand on some of the history. As it reads now there are sections that are repeated almost verbatim. Overall, I enjoyed this book. It is exactly as its title suggests. it's a book about how each state in the United States got its border. The book begins with a section called "Don't Skip This" It would have been helpful if this section included a succinct summary. The purpose of this section is to give a broad background on the formation of the geography of the United States. As I read the book, though, I kept thinking"If I knew about the French and Indian War, The Louisiana Purchase and The Mex Overall, I enjoyed this book. It is exactly as its title suggests. it's a book about how each state in the United States got its border. The book begins with a section called "Don't Skip This" It would have been helpful if this section included a succinct summary. The purpose of this section is to give a broad background on the formation of the geography of the United States. As I read the book, though, I kept thinking"If I knew about the French and Indian War, The Louisiana Purchase and The Mexican-American War, I'd understand a lot of the state shapes." That's oversimplified but a helpful way to start getting your head around the country geography. The other thing I would change about this book is its organization. The states are listed alphabetically. I suppose the author had to pick something and landed on this organization, but the book starts to read like a dictionary. The relationships between bordering states are obviously critical in determining shape. So toward the final third of the book you've largely covered issues resulting in a state's shape because you've already read about a bordering state that comes earlier in the alphabet. The author tries to tie bordering states together by little cross reference mentions in a given state's section. "see Connecticut for more on this" I ended up not wanting to flip back and forth anymore. I trudged forward giving the read a reference book feel. A lovely little book, this, which after a brief introduction dives straight into its topic: fifty sections, each detailing the history behind the odder bits of states' shapes. It's pretty much the ultimate American geography trivia guide, in that none of this stuff will ever find a practical application in your head, but it's fascinating. The number of common borders in the US does lend itself to repetition (in fact, one large chunk about the Louisiana Purchase was so repetitive he ended up excising it and adding a separate section called Don't Skip This, the brief introduction I mentioned earlier), but he tries to keep it to a minimum by cross-referencing as much as possible. This was not as good as I had hoped, though it did have some interest. My big problem was the way he arranged his information, which was with the states in alphabetical order and then dealing with each border. The alphabetical order was the big problem--you spent a fair amount of time flipping back and forth between, say, Arizona and Nevada, or Mississippi and Alabama. Or you didn't flip, and so you forgot part of the story. Just a dumb and lazy way to arrange information that could have been re This was not as good as I had hoped, though it did have some interest. My big problem was the way he arranged his information, which was with the states in alphabetical order and then dealing with each border. The alphabetical order was the big problem--you spent a fair amount of time flipping back and forth between, say, Arizona and Nevada, or Mississippi and Alabama. Or you didn't flip, and so you forgot part of the story. Just a dumb and lazy way to arrange information that could have been really interesting. Audiobook read, but this was entertaining until it got really grating. Good for trivia, not so great for entertainment. I cannot believe I read this whole thing. Some of the explanations are interesting and may one day make for nerd cocktail chatter, but they are not worth suffering through the concluding sentence of each chapter, which is invariably in the style of "...and that's why the Florida panhandle demonstrates America's commitment to equality." What a curious, interesting book. I happened upon this on a friend's recommendation, and was very pleasantly surprised. Organized into 51 chapters, one for each state, plus the District of Columbia, it uses history to explain the geography of each of the states. Stein's style is light and humorous, which helps lighten a book that could suffer from dryness. One critique I have of the book is the repetition, which may be unavoidable given the structure of the book. For example, by the time you get What a curious, interesting book. I happened upon this on a friend's recommendation, and was very pleasantly surprised. Organized into 51 chapters, one for each state, plus the District of Columbia, it uses history to explain the geography of each of the states. Stein's style is light and humorous, which helps lighten a book that could suffer from dryness. The book was informative and a quick read for a history nerd like me, but was also very repetitive. I felt like Stein could have gone more in depth with some of the quirks of borders and disputes but perhaps was saving them for future works. I only gave 3 stars because of the repetitive nature, but as far as reading and information goes I would give 4. For geography or history nerds, this book offers insightful takes on American history and how state borders came to be. It’s not as organic as one might imagine, and is marked by the number of surveyor mistakes along the way! Funny and insightful. However, it got repetitive since most of the states touch and the borders are for the same reason on each side. Stein’s bibliography left a lot to be desired and was too “select” for my tastes. If I ever finish this, I'm probably going to need to get my hands on a print version. I'm reading a library ebook and it's annoying. There is not a copy of the map being discussed on every page, so it gets confusing. I could pull up a Google Map but that would be annoying too. I can't fully judge the book because I'm having trouble with the format. I think I probably still want to read it, but the ebook is no bueno. It's fine, but seems like it wasn't designed to actually be read straight through. It has a chapter on each state arranged alphabetically, which means the information is disjointed instead of being organized by either region or major occurrence that produced the states (such as the Louisiana Purchase). That said, it's actually surprising how logical a lot of the state boundaries ended up being. In the east, a lot of it is due to where rivers create natural boundaries. This plays out elsewhere in It's fine, but seems like it wasn't designed to actually be read straight through. It has a chapter on each state arranged alphabetically, which means the information is disjointed instead of being organized by either region or major occurrence that produced the states (such as the Louisiana Purchase). That said, it's actually surprising how logical a lot of the state boundaries ended up being. In the east, a lot of it is due to where rivers create natural boundaries. This plays out elsewhere in the country too, but many of the more square or rectangular states in the midwest and west were drawn to create states of equal geographic size and/or width. That's kind of an amusing idea in the sense that we have a proportional representation in one house of Congress so just dividing land up by size isn't the most sensible approach, but at least it approaches some degree of logic rather than pork barrel politics. Even in places where borders don't seem too crazy they make some sense--there's a chunk of land taken out of some states because there are mountains on one side, making the town inaccessible and ungovernable to the state it should logically be a part of. And then there's Texas. Sure we've all heard the stuff about the ability to divide into five states, but the story of the Oklahoma pandhandle is more interesting. At the time, 36' 30" was the boundary above which a state could not have slavery. Texas wanted slavery, so it gave up all its lands above 36'30". But the Kansas-Nebraska Act also created a boundary of 37'. So that space between 36'30" and 37' became the Oklahoma panhandle and allowed Texas to have slavery. * The District of Columbia had to be a perfect square, so if Georgetown had ended up being the northern border in one spot it would have been almost entirely located in Maryland. So they moved the square to have it more evenly split. Then people living in present day Arlington petitioned to have the southwest corner shorn off and given back to Virginia in 1846. * Most of Maryland's borders were due to Lord Baltimore being a doofus and not having proper surveryors. For example, Fenwick Island was supposed to be part of Maryland and not the southern tip of Delaware, but it was mistaken for Cape Henlopen, where the border was actually supposed to be. Maryland was also supposed to run up midway through Philadelphia. Basically it lost every dispute it had. * The one example of one person causing trouble with borders came about in Montana, where one clever guy who had an in with Congress got it to push Montana's western border further into Idaho. * New Jersey litigated with New York over who actually owns Ellis Island in the 1990s on the grounds that New Jersey owns all "above water" surfaces on its part of the Hudson boundary, but not islands, which are owned by New York. The idea was to give New Jersey rights to docks. But since Ellis Island was expanded via landfill, New Jersey argued that it should own it. It's now technically in both New Jersey and New York. * That random part of Michigan that doesn't connect to it was a consolation prize taken off of Wisconsin after territory taken away from Michigan to grant Indiana access to waterways on the Great Lakes prompted parts of Michigan and Toledo to start a war with each other. * There were problems with overlapping land claims between Connecticut and Rhode Island, where Connecticut's boundary was supposed to stop at the Narragansett Bay and Rhode Island's was supposed to go further than that. To fix it, Charles II tried to rename the more western river border for Rhode Island to Narragansett Bay, thus making the dispute technically go away. That didn't fool Connecticut and it took until 1840 to settle the boundary. * In 1862, Rhode Island and Massachusetts traded East Providence and Pawtucket for Fall River. * Benjamin Harrison shuffled the documents creating North and South Dakota when he signed them, so we don't actually know which one was created first. * Congress kept taking land away from Utah because it didn't trust Mormons. * Several states, including Kansas, actually gave up lands that had a lot of mining options in them because they thought the types of folks it would attract would make them harder to govern. My wife and I read several portions of How the States Got Their Shapes by Mark Stein while we drove to and from Kansas over the Christmas Holidays. The book is a state-by-state description of how the 50 states, plus DC, obtained their current boundaries. The book can be rather repetitive, if you read it straight through (after all, the states all share borders, and if each chapter of the book tells the story of every boundary of one state, there has to be repitition, with the exception of maybe My wife and I read several portions of How the States Got Their Shapes by Mark Stein while we drove to and from Kansas over the Christmas Holidays. The book is a state-by-state description of how the 50 states, plus DC, obtained their current boundaries. The book can be rather repetitive, if you read it straight through (after all, the states all share borders, and if each chapter of the book tells the story of every boundary of one state, there has to be repitition, with the exception of maybe Hawaii and Alaska). But if you read only the chapters on the states you are interested in, it is a very fun and interesting read. The book provided many little-known anecdotes and history lessons about the way our United States were formed. Based on what we read (not the entire book), it seemed to my wife and I that there were several things that impacted how a state's boundaries are formed: where resources lie (coal, forest, good soil, etc. ), access to water and/or lakes, Congress's efforts to create states of roughly equal size, Britain's, and then the U.S.'s, relations with Spain and France before the creation of the U.S. as we know it today. Not surprisingly, slavery was a very important factor in the creation of many states, determining where north-south boundaries would lie to maximize the number of citizens, either pro- or anti-slavery, that resided within the state (e.g., Kansas, Missouri). More surprising was the role that incompetent surveyors, prideful politicians, and bribing landowners played in many of the quirky anecdotes (e.g., Idaho, Tennessee). I was also surprised to read that Georgia and North Carolina actually fought a war over a several-mile-wide strip of land along Georgia's north border. I also learned things about the shape of states that I had never known before. For example, there is a little bubble of Kentucky in the southern tip of Missouri created by a north-ward bend in the Mississippi. Delaware's northern end is a semi-circle. Summary: A state-by-state (plus the District of Columbia) description of exactly how and why every state border came to be in its current precise location. It's not as dry a read as it sounds. Thoughts: On the whole, I really enjoyed this book. The stories behind the state lines is fascinating (did you know that the NY/NJ state line was in dispute even up until the 1990s? I sure didn't! And poor Maryland - it contested the placement of every one of its borders, and lost every. single. time.). Ste Summary: A state-by-state (plus the District of Columbia) description of exactly how and why every state border came to be in its current precise location. It's not as dry a read as it sounds. Thoughts: On the whole, I really enjoyed this book. The stories behind the state lines is fascinating (did you know that the NY/NJ state line was in dispute even up until the 1990s? I sure didn't! And poor Maryland - it contested the placement of every one of its borders, and lost every. single. time.). Stein covers all the "major players" in determining state lines (the 49th parallel, 32-30 and the Missouri Compromise, the Louisiana Purchase, Northwest Territory, Oregon Territory, etc), as well as all the interstate squabbles along the way. There's also a long history of bad orienteering (and bad map-reading) leading to state lines being a few miles off of their intended location. Naturally, the King(s) of England had a lot to say about the location of the colonial boundaries as well. But there's plenty of other interesting stories, like how the Oklahoma panhandle is a result of Texas not wanting to give up slavery when it joined, or how multiple times the western territories split off part of themselves because they didn't want their voting power diluted by "undesirables" (usually miners). Ok, if you're into interesting facts, ramdom ways to make conversation (that may not go anywhere), or just want to surprise yourself with your own level of ignorance about the actual shape of states (including the one you live in) then this is the book for you. If, however, despite all that is written above you find repetitveness, poor organization, and failed attempts at grandiose statements and/or humor, perhaps you should pass. This was a pretty poorly written book. It was organized alphabeti Ok, if you're into interesting facts, ramdom ways to make conversation (that may not go anywhere), or just want to surprise yourself with your own level of ignorance about the actual shape of states (including the one you live in) then this is the book for you. If, however, despite all that is written above you find repetitveness, poor organization, and failed attempts at grandiose statements and/or humor, perhaps you should pass. This was a pretty poorly written book. It was organized alphabetically rather than regionally or chronologically, and thus you get stuck with identical statements hundreds of pages apart. In addition, due to a lack of desire for error I would imagine, you get constantly referred back to sections that you have read (or will read) without the aid of page numbers. There are several typos including the whopper of a mislabeled map that indicates almost the opposite of what it is trying to say. So, if I were rating this on style or flow, it would get one star or less. But I am the sort that finds random facts interesting, and there are a lot of interesting facts about the shape of states. New Jersey is the owner of any area on Ellis Island that was filled in by landfill? Delaware has a half circle for its upper border? Maryland never, ever gets its way? And the fact that each state is 5 pages or less allows you to be more forgiving of the writing style as it is a discrete unit rather than an entire work you have to consider. My parents live near Toledo, Ohio, and one of the streets near their house is called "Old State Line Road." After reading this book, I understand the significance of this street's name and how it is related to Michigan's Upper Peninsula. As a bonus, I learned that a large part of northern Ohio was claimed by Connecticut. 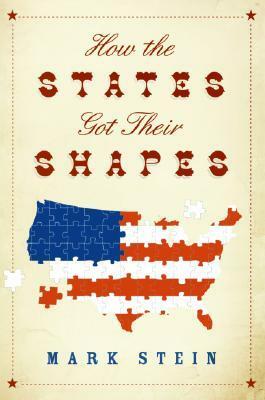 This book takes an interesting approach to U.S. history by explaining why the states have the shapes that they do. I never really had a reason to question why the states are shap My parents live near Toledo, Ohio, and one of the streets near their house is called "Old State Line Road." After reading this book, I understand the significance of this street's name and how it is related to Michigan's Upper Peninsula. As a bonus, I learned that a large part of northern Ohio was claimed by Connecticut. This book takes an interesting approach to U.S. history by explaining why the states have the shapes that they do. I never really had a reason to question why the states are shaped the way they do, but once I started thinking about it a bunch of questions popped into my head. There is an introductory section, inelegantly titled "DON'T SKIP THIS," that lightly goes through the major events that shaped America's borders like the Louisiana Purchase, the Mexican War, etc. Then the book has 50 chapters, one for each state, in alphabetical order. Each chapter methodically goes through the story behind each border. The book ends with a bibliography for each state, as if to dare you to fact check him. Because of the organization of the book, it's very disjointed to read. Some of the stories are so woven together, like New York and Pennsylvania, that it would make sense to group them together. But as it is, you can read these chapters in any order without it making much difference. I think it might have been a more interesting book if they were listed in order of statehood. Then it could have highlighted other factors affecting states like the Missouri Compromise. This book doesn't take very long to read because there are a lot of maps and chapter heading pages, so it can be read very quickly (in a few hours in my case) depending on how much you want to retain. Well, I went into this book hoping to find out why the states' borders have some of the funny twists and turns they do. And as far as that goes, it lived up to my expectations. This kind of stuff fascinates me. Pretty much anything to do with American history commands my attention. And sure enough, everything you could want to know about the states and how they got carved out is all in here. The drawing of the Mason-Dixon line ... attitudes toward future states post-Revolution ... surveying mist Well, I went into this book hoping to find out why the states' borders have some of the funny twists and turns they do. And as far as that goes, it lived up to my expectations. This kind of stuff fascinates me. Pretty much anything to do with American history commands my attention. And sure enough, everything you could want to know about the states and how they got carved out is all in here. The drawing of the Mason-Dixon line ... attitudes toward future states post-Revolution ... surveying mistakes (some of which were fixed and some of which weren't) ... how things like slavery and gold and access to waterways affected borders and state sizes ... even little tidbits about border skirmishes. Being from Michigan, I knew all about the Toledo "War" and the ensuing gift of the Upper Peninsula, but I wasn't aware that other states had their own dust-ups about where to draw their borders. This is the first pop-geography book I’ve come across, and while many of the state-shaping forces described here are somewhat intuitive (e.g. existing colonial borders, geographical boundaries, access to natural resources, slavery), I was surprised by the extent to which borders were contorted, and remain contorted to this day, to prevent islands of lawlessness or to enforce class and religious separation. Apparently, farmers don’t get along with gold miners, and just about everyone wants to kee This is the first pop-geography book I’ve come across, and while many of the state-shaping forces described here are somewhat intuitive (e.g. existing colonial borders, geographical boundaries, access to natural resources, slavery), I was surprised by the extent to which borders were contorted, and remain contorted to this day, to prevent islands of lawlessness or to enforce class and religious separation. Apparently, farmers don’t get along with gold miners, and just about everyone wants to keep some distance from those pesky Mormons. Today’s borders also attest to the awful state of the surveying profession in early nineteenth century America and, earlier yet, the avarice and geographical naïveté of Europeans who defined the original colonial boundaries. Prepared by earlier reviews, I didn’t find the state-by-state repetitions contained in the book so terribly annoying. Repetition does appear to be an innate quality of Stein’s writing though. (According to the book jacket, Stein is, among many other things, a playwright. What a surprise.) The book is chock-full of illuminating and nicely-rendered maps. Also, Stein writes like the geography teacher you wish you had in seventh grade. His historical tidbits and even his physical descriptions of the states are entertaining. All too often, Stein catches one state in a creepy embrace with another. Pretty much what the title says. He goes through the 50 states, in order, and describes why their borders are where they are. (Even Alaska and Hawaii.) That means there's lots of repeating, and lots of "to see more, turn to [other state]' But that's OK. Not real great for just reading straight through. Some good stuff. Surprising how late some of these disputes went on. And how much was decided by somewhat random chance. Like someone screwed up the survey. Or someone read the royal decree wrong. Pretty much what the title says. He goes through the 50 states, in order, and describes why their borders are where they are. (Even Alaska and Hawaii.) That means there's lots of repeating, and lots of "to see more, turn to [other state]' But that's OK. Not real great for just reading straight through. Some good stuff. Surprising how late some of these disputes went on. And how much was decided by somewhat random chance. Like someone screwed up the survey. Or someone read the royal decree wrong. Or a little corner of one state (Utah, Mass) is easier to get to from another state (Wyoming, New York) so the piece is given away to the state that can police it better.